Frequently asked questions and guidelines on how to use RBI Events. How do I place an order (register to the event)? How can I resubmit an abstract? Can I pay using American Express or Diners? Can I login using Facebook, gmail, etc.? Where and how do I book a hotel? I paid with credit card but got the details to make payment in the 'Thank you for your purchase' email. Where can I purchase registration fees (tickets)? Do I need separate accounts for conference website and RBI Events? 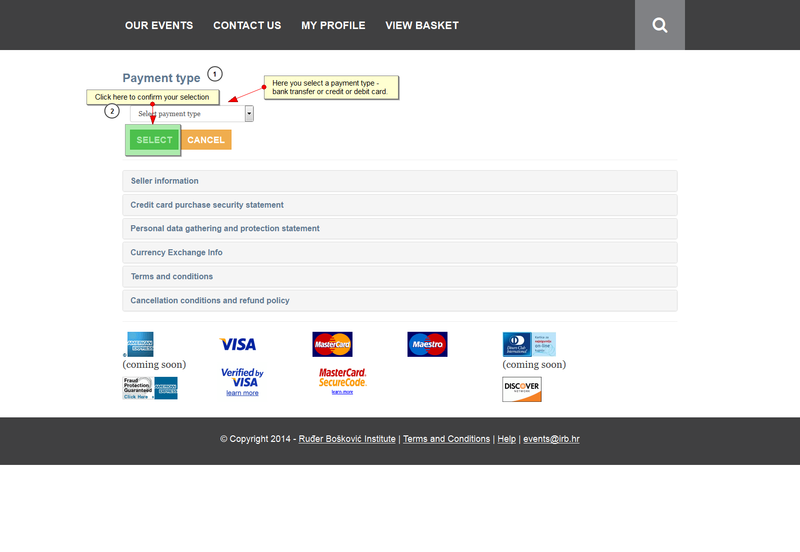 The Payment Pages used at RBI Events are secure and you can safely enter your card details to pay for your order. Credit or debit card (VISA, MASTERCARD, MAESTRO). To place an order you must login into the RBI Events. You can login before adding items in your basket or you can add items first and then login after you select Proceed to Checkout. If you don't have an account you must create one first by registering. 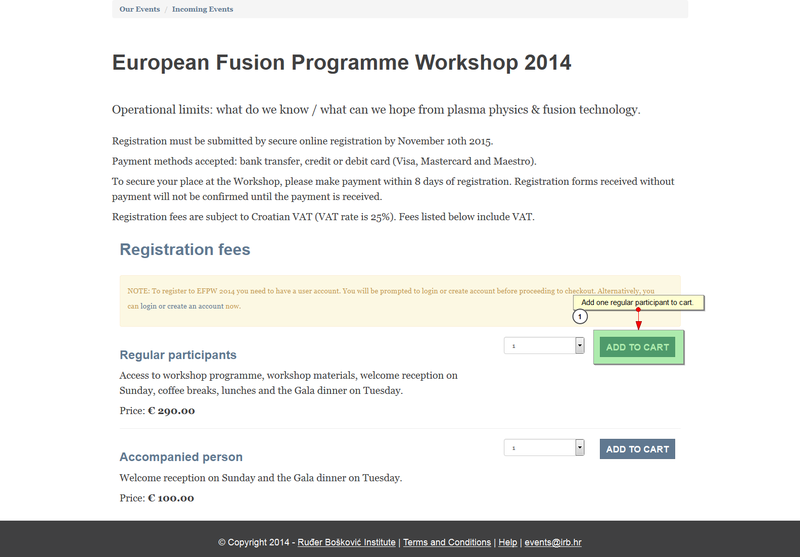 You can register by clicking on the LOGIN in the header. User account is valid both for RBI Events (a place where you purchase registration fees) and your conference website (where you can submit or resubmit your abstract, if needed). Furthermore, your account is valid for any future conferences you may attend. After you fill in the registration details you will receive a confirmation email with user account activation link. Please follow the link for successful activation. 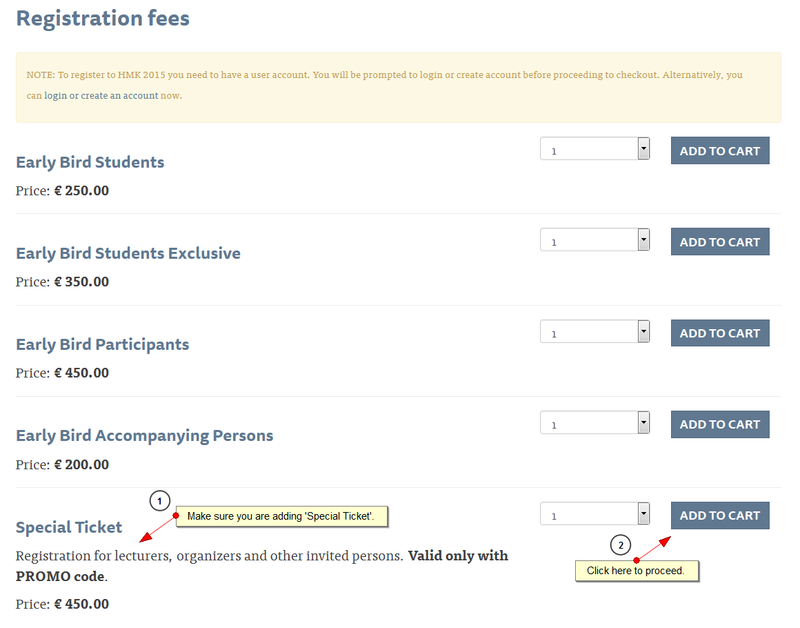 Once your user account has been activated you can proceed to add registration fees (tickets) for the conference you want to attend. Add items to your basket from the event you want to attend by clicking on Add to Cart. You can add more than one ticket. Once you have your items in your basket, you can then (if you wish) increase the quantity by entering the desired amount in the quantity field and clicking on Update Quantities. 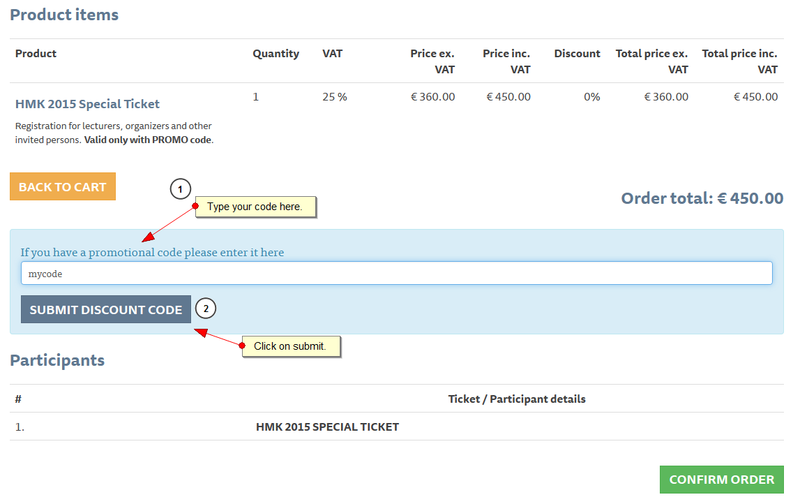 You can add different types of tickets by clicking on Continue Shopping. 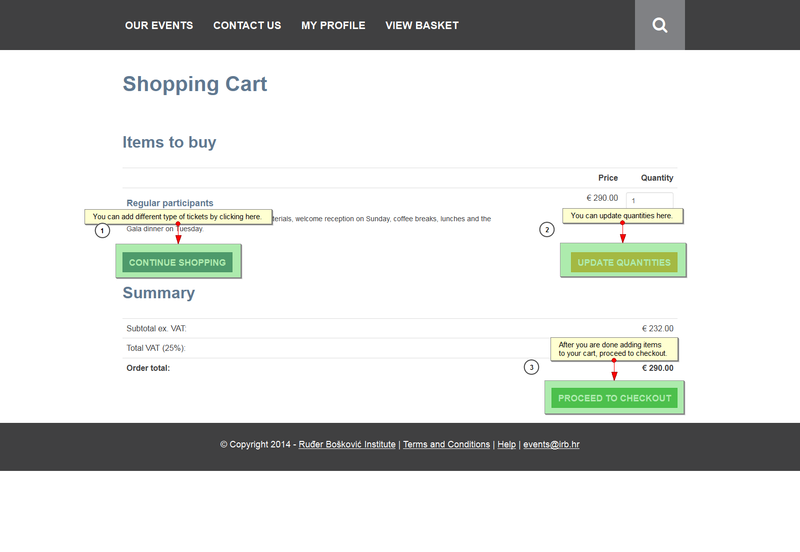 Clicking on the Proceed to Checkout button on the Shopping Cart takes you to the Participant Details. 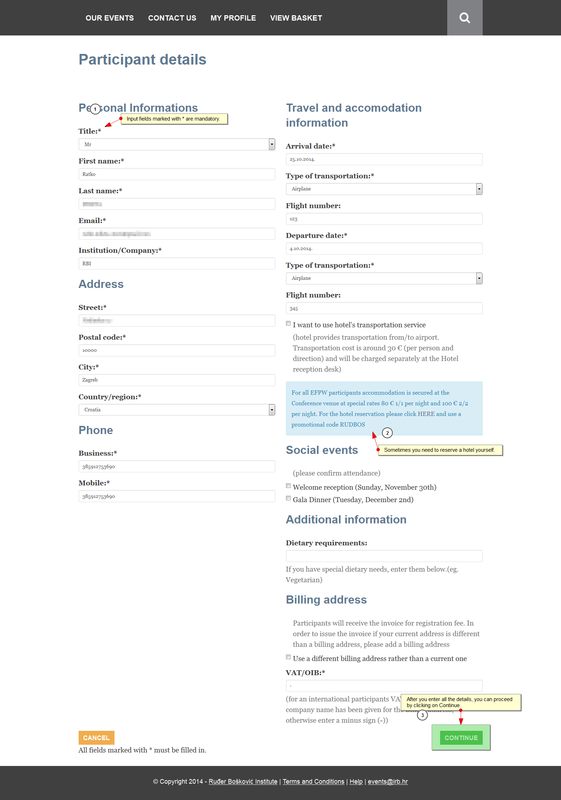 Here you can enter your personal information and other details important to your arrival and stay at the event. After you enter all the details, you can proceed by clicking on Continue button which will take you to Confirm Order screen. 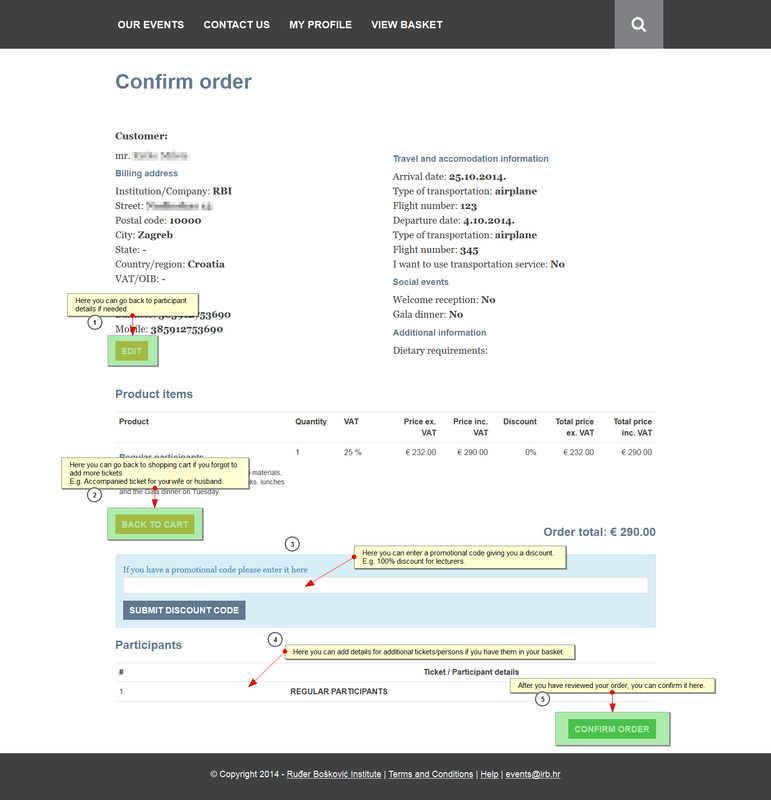 Here you can see (or edit) summary of your order. Also, here you can enter a promo code (if you have one) and/or add details for other participants (if you are shopping for more than one person). After you are done, click on Confirm Order. On the next screen, you select payment type – bank transfer or credit or debit card. If you select Bank Transfer, you will see Thank you screen with necessary data to make your payment. If you select Credit or Debit Card you will be redirected to payment gateway where you can make your payment online. 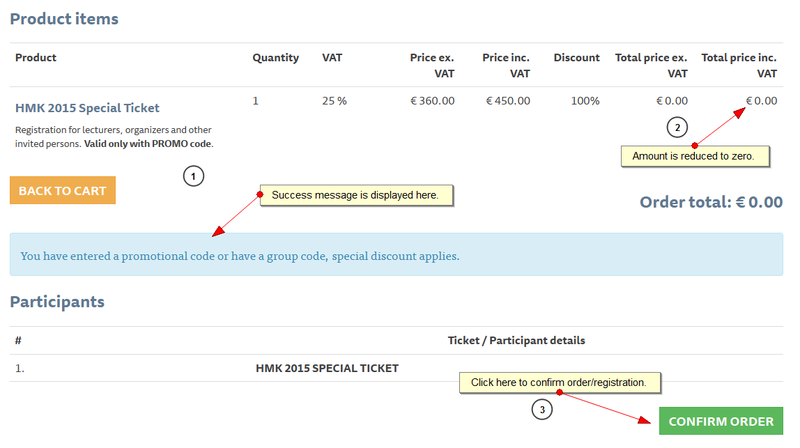 Promo codes allow you to get the discount on selected tickets. Discounts can range from 1% to 100% (for completely free registration). Add Special Ticket to your basket by clicking on the 'Add to Cart' button. Click on 'Proceed to checkout' to continue. Type in your promo code and click on 'Submit discount code'. If you entered a correct code, you will see success message and your price will be reduced (in this case to 0 since the code gives 100% discount). Click on 'Confirm Order' to finish your (free) registration. Instructions are in the PDF below. By clicking on My Profile on the top of the page and then on Edit button you can add more details to your profile. This can be useful if you (hopefully) plan to register for multiple events in the future. By adding those details now, you save a lot of typing later since your details will be filled in automatically. You can buy multiple tickets of any kind. On the confirm order screen you will be asked (at the bottom of the screen) below Participants to add personal data for additional persons. Although this is technically possible, it has been disabled to avoid confusion. You can buy multiple tickets in a single process only from one conference at the time. Clicking on a button 'Submit an abstract', usually found under Call for Abstracts on your conference website. By logging into conference website and clicking on login/my profile in the header. You will see option 'Submit an Abstract'. By logging into events.irb.hr and clicking on login/my profile in the header. You will see option 'Submit an Abstract' (for all active conferences). You can resubmit your abstract as many times as you like, following above steps. Pay attention to descriptions, they give you instructions for input. Make sure you select presenting author. If you are uploading part of abstract, because of special characters and formulas, make sure it is in docx format. If you are uploading an image, please upload png, jpg or tiff only. After you are done filling in the form press submit (or cancel if you want to give up). Login into the conference web page by clicking on the 'Login' (in the header) and then click on 'My Profle' (in the header). In your profile you will see all your abstracts. 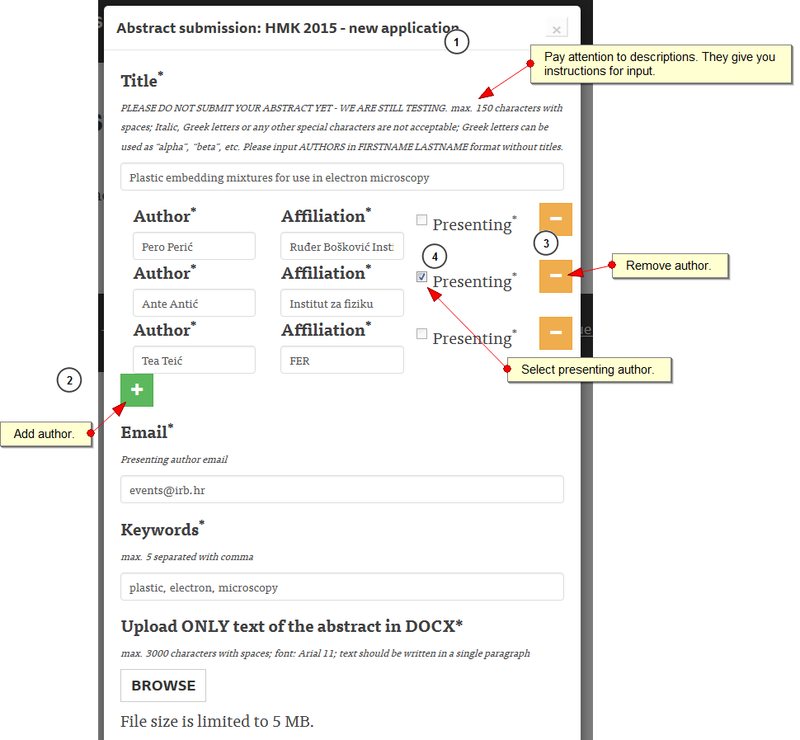 Click 'edit' button to edit and resubmit your abstract. No, not at the moment. We plan to support this. It depends. Sometimes organizers handle booking for your, sometimes you have to do it yourself. This section of email says "If you made a Bank Transfer, please pay with the following information". It is a reminder for users who chose bank transfer in case they missed it on the website during shopping process. If you have problem accessing Payment Gateway maybe your company firewall is blocking it. Please consult with you IT department. You can purchase registration fee(s) for your conference on RBI Events website. You can get there (here) by following REGISTER HERE link on the conference website or by directly going to RBI Events website. No. No matter where you register (on conference website or RBI Events) your username and password are valid both for RBI Events and your conference website (or any future conference websites in our system).